Take Back The City has made headlines in recent weeks after occupying three properties in Dublin’s north inner city. A GROUP OF housing activists in Dublin this evening hosted practical training sessions for tenants who may have to deal with illegal evictions. Take Back The City, a group of activists built up of over 15 grassroots groups, has made headlines in recent weeks after occupying three properties in Dublin’s north inner city. This evening, the group held a practical training session in a north inner city building for tenants who may wish to avail of practical training. Over 50 people gathered outside the building on Belvedere Court this evening waiting for Take Back The City to open the doors to the event. As people waited, Take Back The City members took their names and contact details. A number of members of the media were among those waiting outside the building. However, they were informed that they would not be allowed to attend the training sessions. Topics being discussed at the training sessions included defending against eviction and community mobilising, according to the social media page for the event. Speaking to the media outside, a spokesperson for Take Back The City said that the training sessions are for “tenants, and indeed anyone, who may need practical training in order to be able to resist illegal evictions”. While he wouldn’t provide a detailed description of what the sessions would entail, he said that they are “a step by step guide to what you should do in case your landlord decides that they’re going to throw you out onto the street illegally … who you should call, the kinds of practical steps you should take in terms of ensuring you aren’t illegally evicted”. What I will say is that it’s peaceful, it’s based upon what the law is, it’s about telling them the resources that they can go to, how they can get in touch with local housing action groups, who can then come along and support them. When asked why the media were not being permitted into the training sessions, the spokesperson said that it was “fundamentally because the people who are here may not want to essentially be identified, which is a possibility if the press is there”. “On top of that, although we aren’t doing anything particularly controversial, it was also the feeling of the people giving the training that it would be better for it to be in a casual, non-pressurised setting, which is very difficult when the press is here,” he said. 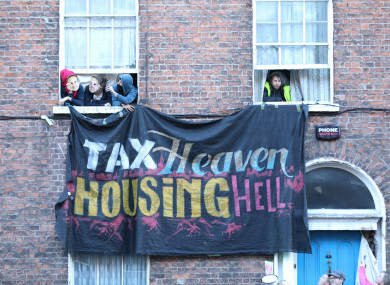 In recent weeks, activists in Dublin have occupied properties on Summerhill Parade and North Frederick Street in protest against the national housing crisis. High Court injunctions have been filed for the vacation of both properties. The activists have since vacated both properties. However, they are now occupying 41 Belvedere Place. The High Court today granted the owners of the property, MJH Property Management an injunction compelling the protesters to immediately vacate and cease the unlawful trespass on the property. Speaking this evening, the Take Back The City spokesperson said, however, that they will continue to occupy. The spokesperson said he would not comment on their “exact plan on the possible eviction in Belvedere”. Email “Housing activists host practical training session for tenants 'to be able to resist illegal evictions' ”. Feedback on “Housing activists host practical training session for tenants 'to be able to resist illegal evictions' ”.